12.31.2003 - I set armadillo traps at a house in a suburban community on the east side of Orlando. I had trapped an armadillo already, but the customer wanted me to continue trapping, in case there were more. The yard suffered from significant armadillo digging. I got a call on the morning of the 31st, from the owner of the house, and she told me that one of the cages contained a large and aggressive cat. "I think it's a bobcat", she said. "Suuurree… it's a bobcat", I thought. The customer is always telling me about wild and crazy animals that do not exist. Every harmless little Corn Snake is suddenly a rattlesnake once spotted by the suburban-dwelling concerned citizen. I catch stray cats from time to time, so it was no surprise that I'd caught one in one of my armadillo traps and it had been misidentified by an excited suburbanite prone to hyperbole. "I'll come get it as soon as I can", I said, and I went about my day tending to more important wildlife issues, ready to retrieve the cat later that afternoon. However, the lady called back an hour or so later, saying, "I really think you should come get this cat. I'm fairly certain that it's a bobcat". I was still skeptical, because I'm always skeptical, because of the repeated tendency for people to be wrong, but I went over to the house right away anyway. I marched around the house to the trap, ready to show the lady that it was simply a boring old, common stray cat. As I turned the corner and approached the trap, I got that nice jolt that one gets when encountering the unexpected. To my surprise, there sat a small bobcat. I quickly noticed how alert the animal was. Some critters lay in the trap with a dull look and lazy countenance. This bobcat stared at me with great intensity. It would not remove its fixed gaze from me as I circled the trap. I was of course careful not to touch the trap or stick my fingers inside. I brought the cage closer to the edge of the woods, and took a few photos. It was a beautiful animal. I liked seeing the long, thick arms and the little bob tail. I opened the cage door to let it go, but it didn't watch the door open. It continued to stare at me, unblinking. It slowly backed up, as if instinctively, and soon it was completely outside the cage, but so focused on me that it didn't even realize that it was free. Suddenly it sensed that it was out of the cage, and it turned and bolted for the woods. I was most pleased, and thought that this was a fine catch to end the year. I do not provide actual bobcat capture and removal services. 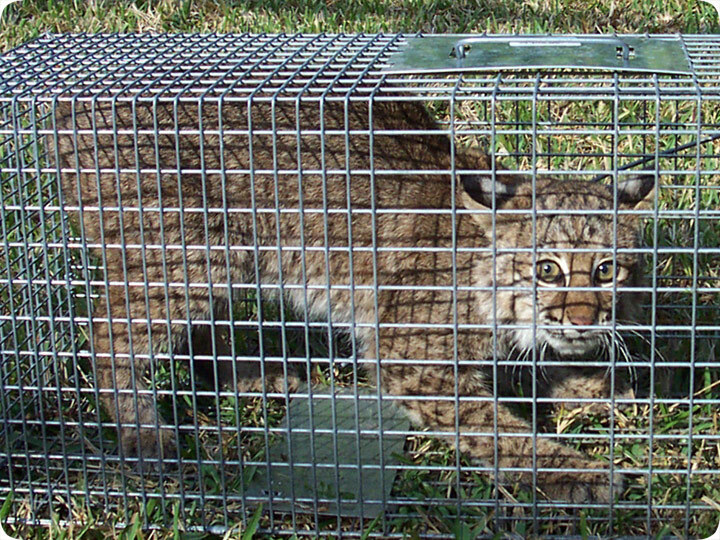 This animal is under the protection of the Florida conservation commission, and in reality bobcats don't cause any problems anyway. It's not like anyone in these suburban homes has a chicken coup for the bobcats to raid. Even if tasked with a bobcat removal request, I don't think I could do it. This was just a matter of chance. The cat must have sniffed something interesting in the trap, such as the scent of a previously caught animal, and decided to investigate. I doubt this wary animal will make the same mistake again! Do it yourself: Visit my How To Trap Wildlife page for tips and advice.